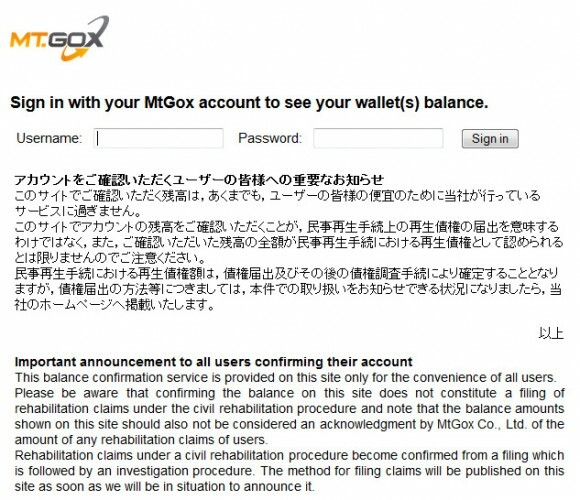 MtGox has announced that they were able to recover 200000 Bitcoins from an “old-format wallet used prior to June 2011”, coins that could be returned to customers that NtGox owes money to. This “miracle” sounds a lot like a popular scam scheme where customers get back some of their invested money and are happy that they get at least something and are not left completely empty handed. We do not believe in miracles where you can find so many BTCs in an old and unused wallet, just like that Mark Karpeles could also find another 650000 BTC stashed in his personal “old wallet”, coins that we will surely not announce as being found. This balance confirmation service is provided on this site only for the convenience of all users. 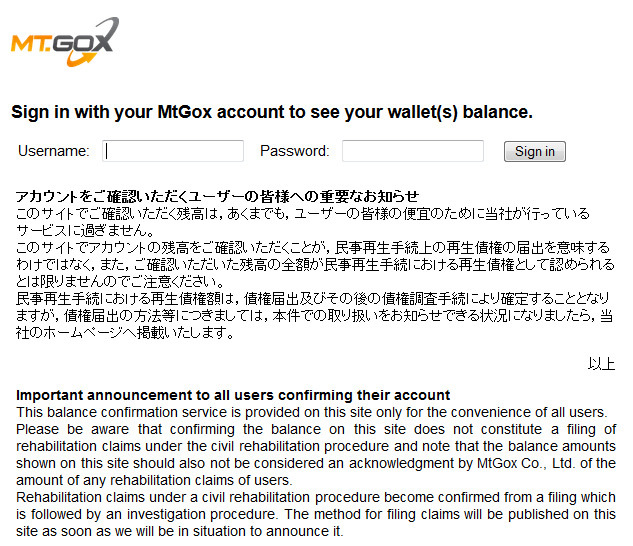 Please be aware that confirming the balance on this site does not constitute a filing of rehabilitation claims under the civil rehabilitation procedure and note that the balance amounts shown on this site should also not be considered an acknowledgment by MtGox Co., Ltd. of the amount of any rehabilitation claims of users. 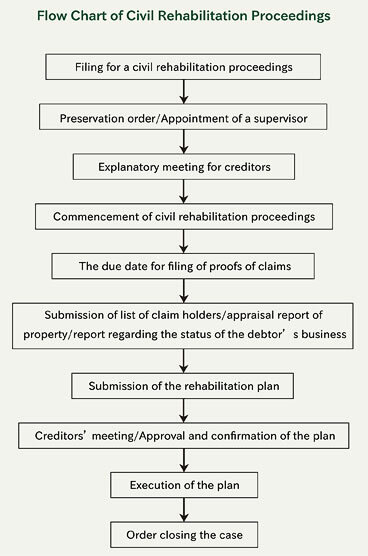 Rehabilitation claims under a civil rehabilitation procedure become confirmed from a filing which is followed by an investigation procedure. The method for filing claims will be published on this site as soon as we will be in situation to announce it. We have logged in to check if the website does indeed show the correct balances from before going offline and we could see what we’ve had in our account listed correctly. Just a few Bitcoin cents that were there for the sake of testing some automated trading solutions with MtGox support, otherwise we would not have any BTC there. At the start of February 2014, illegal access through the abuse of a bug in the bitcoin system resulted in an increase in incomplete bitcoin transfer transactions and we discovered that there was a possibility that bitcoins had been illicitly moved through the abuse of this bug. Further we will fully cooperate with inquiries from authorities and investigations related to this matter, in Japan or overseas. In order to increase repayments to our creditors, it is necessary to explore the possibility of having MtGox Co., Ltd. continue its business. This is why the civil rehabilitation procedure has been chosen, Rebuilding MtGox Co., Ltd under the supervision of the court in a legally organized procedure while giving proper explanations will not be for the sole benefit of the company but for that of the whole bitcoin community. Please refrain from contacting the office of the supervisor/investigator. If you are wondering what this procedure means, essentially they are going to be checking what assets and liabilities MtGox has in order to see if the company could continue operating or they will go bankrupt. The total amount of assets the company has seems to be a bit over half of what its debts are, so they should be able to return some of their debts to customers that have deposited coins and money in the service. This document is the first official one that confirms the amount of stolen Bitcoins, though there are already some speculations that the claimed theft of coins is a lie and the whole thing is a scam by MtGox to steal a lot of money from their customers.